I like other people. I just don't really enjoy playing games with other people. To me, gaming is a hobby I like to do in privacy, so I can enjoy some nice RPG mechanics, a pleasant story, or just zone out on a train ride or a lazy Sunday afternoon. Playing with others requires a level of responsibility I stress about living up to or a level of competition that rubs against my passive gaming habits. That is, unless I'm playing Super Smash Bros. Then I'm all set to thrown down! 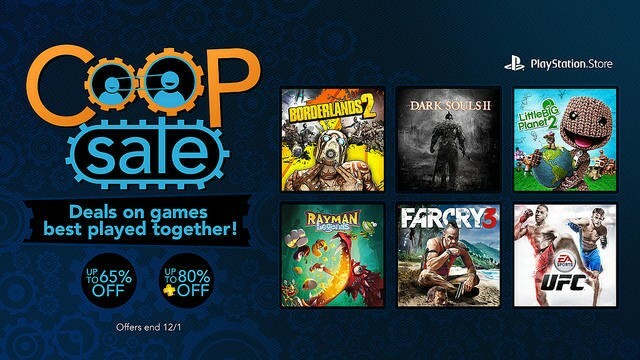 That being said, this week's PlayStation "Co-op Gaming Sale" might not be for me. Sony has provided a large selection of games you can play with a friend and slashed the prices. Check out the full list below. I've played a bunch of these games, but only the single player portions. Rayman Origins and Rayman Legends are my highlights of the sale, but I already have those. I'm going to wait for Black Friday to see if any other games pop up, but there is such a diverse option of games here that everybody should be able to find something they like. What's your fancy?